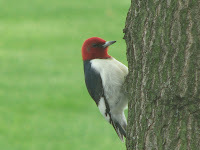 We have read that red headed woodpeckers are becoming scarce but not here. We have seen at least three around here, we even watched a pair chisel out a nest in a dead tree behind the dam. 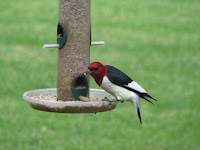 This entry was posted in Uncategorized and tagged bed and breakfast, birds, Mission Oak Inn, red headed woodpecker by admin. Bookmark the permalink.